Natural Green Kyanite healing crystals in what are called blade shapes. Color ranges from dark to medium green. Some have streaks of blue in their center. Size varies with most being 1/2" to 3/4" long, 1/4" wide, 3/16" thick (some larger). Opens and clears the Heart Chakra, connects the emotional body to the etheric body. Enables you to process feelings and release sorrow, alienation, anger and grief. Encourages compassion for the suffering and oneness of all life. Increases the ability to reach out to others and to love again after loss. Green Kyanite has a Triclinic crystal system and is in the mineral class of silicates. It is usually formed as long, bladed crystals that can be up to a foot long. Kyanite's coloring can range from bluish, green or aqua to almost colorless. Black sprays are also found in Brazil and are very brittle. Quite often it is found with Andalusite and Sillimanite and it is an important refractory for porcelains, high temperature bricks and spark plugs. Until recently it used to only be found in the U.S., but it has now become available from mining efforts in Kenya and East Africa where they are uncovering some of the largest and clearest crystals to date. Green Kyanite is very beneficial when placed between the heart and navel during healing or meditation work. I have also found it to be calming just carrying in my pocket where I can hold it from time to time. Green Kyanite will not accumulate or retain negative energy or vibrations and seems to be unlimited in its application to attune your mind. It is also beneficial when used to connect with the astral plane or to connect to spiritual guides. Green Kyanite brings tranquility and a calming effect to your whole being. It aids in removing confusion that can come from emotional, spiritual or intellectual issues or problems. Green Kyanite stimulates communication and a psychic awareness on all levels. It also advances the connection between the higher levels of intuition and heart felt love. Green Kyanite assists in aligning all Chakras with no conscious direction. If directed, it can also open blocked Chakras as well. It may also be used for disorders of the muscular or urogenital system, adrenal glands, and throat. 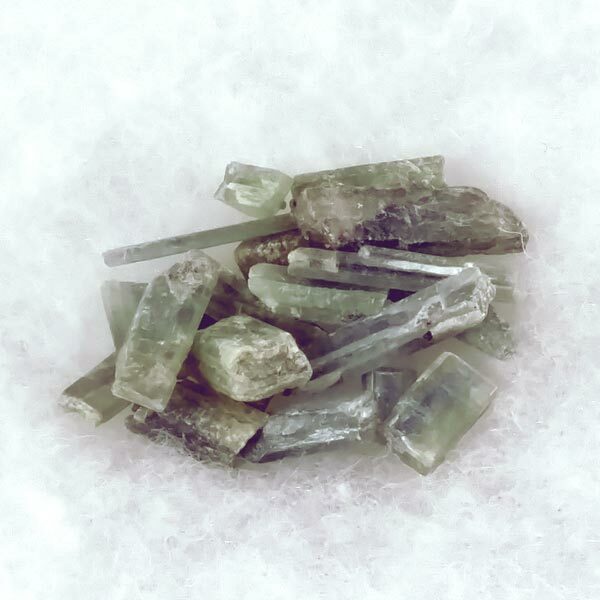 Green Kyanite has a special affinity with Taurus, Libra and Aries. It's Energy is Receptive and its Element is Earth. 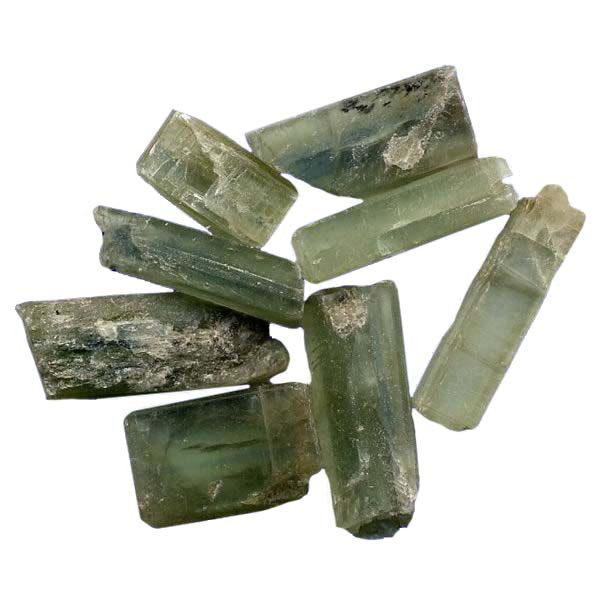 As with many green stones, Green Kyanite may be used for recipes or manifestations of abundance. It has been noted that Green Kyanite can be useful in facilitating meditation because it is gentle and balanced.